So you are a taxi driver who has lost your rice bowl because of Uber. Or you are an office worker who faces the prospect of your new colleague being a robot. These are some effects of the so-called "disruption" - where technological developments completely transform traditional work environments - affecting Singaporeans and causing apprehension about the future, especially for the middle-aged and above. This is even as the country reaps the fruits of decades of far-sighted, tightly managed and prudent economic planning. Indeed, recent employment figures show the number of layoffs at a seven-year high, amid sluggish economic growth and restructuring. Yet jobs involving shift work, difficult environments or relocating to another country still go begging, or have to be filled by foreigners. It is a mixed message that the Committee on the Future Economy (CFE) will no doubt have been weighing up as it looks at the labour market and what lies ahead. A major challenge the committee would have had to grapple with is Singapore's greying workforce, a point Manpower Minister Lim Swee Say has been pressing home. Lower birth rates and an already high labour force participation rate among residents - at 68 per cent last year for those aged 15 and up - mean the country will see a continued slowdown of local labour force growth towards negligible levels or even stagnation in the next decade, Mr Lim told Parliament last year. To help older workers stay on in the workforce, his ministry is raising the re-employment age from 65 to 67 from July this year. Companies have also been encouraged to improve their productivity by automating processes. But there are fears of workers being displaced by machines. Technology is taking over routine jobs in factories and offices, and not just low-skilled jobs but even ones traditionally done by degree-holders, such as accounting services. At the same time, technology is creating new products and jobs, such as 3D-printing for companies to make prototypes quickly rather than outsourcing this process. The key question is how to ensure workers are ready to take on these jobs. Minister for Education (Higher Education and Skills) Ong Ye Kung, who co-chairs the CFE sub-committee on future jobs and skills, said at a forum last year that Singapore has to move from being a "control tower" economy with many company headquarters, to a "runway" economy where plans are put together and products and services are sent out into the world. "You're no longer just controlling, monitoring and managing things. You need skills that can actually make things happen. Skills that are practical and applied in nature," he said. To help workers better navigate this changing nature of work, the SkillsFuture movement was rolled out two years ago to drive a culture of lifelong learning. The idea is to keep picking up industry-relevant technical skills and essential generic skills throughout working life. This should also start before people even look for a job; more is being invested in career guidance, internships and ensuring industry needs are being fed back into education curricula, so that young people are more aware of the jobs available and are equipped with the basic skills they will need. This was a recommendation also made by the Government Parliamentary Committee (GPC) for Finance, Trade and Industry in a report made public last month. The GPC also suggested a national registry to track educational outcomes as a metric for the quality of training providers. Industry transformation maps for 23 industries are being launched, setting out sector-specific skills, and professional conversion programmes train workers to take on new roles in over 50 jobs. Manpower GPC chairman Patrick Tay says he hopes the CFE report will set out ways for the government, unions and employers to work together to ensure plans like the industry transformation maps are followed through. He also suggests a national programme for "training to better understand and appreciate digitisation and disruption so as to stay able, agile and adaptable". This is something like the Best/Wise programme decades ago to upgrade workers' numeracy and literacy skills, says Mr Tay, who also heads the National Trades Union Congress' new Future Jobs, Skills and Training unit. For all the talk on retraining, it may not be a walk in the park for workers to pick up an entirely new skill and be job-ready in six months. SIM University (UniSIM) labour economist Walter Theseira says the opportunities may be more in careers related to things they already do, so their skills are transferable. Ms Wong Su-Yen, chief executive of the Human Capital Leadership Institute at Singapore Management University, says traditional work arrangements could change to accommodate people who take on additional jobs or training to develop experience in a new field. "We need to recognise the need for people to work while preparing for 'the next thing' at the same time," she says. 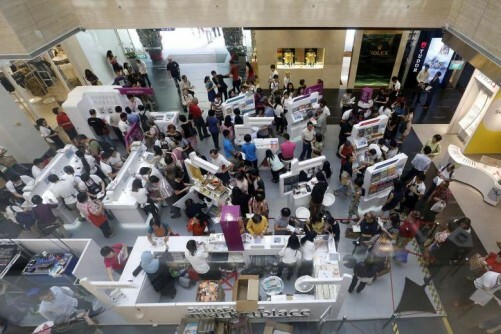 Although economic growth has slowed, Singapore is still creating jobs for the future economy. Last year's inbound investment totalled $9.4 billion and is now expected to result in 20,100 new jobs, the Singapore Economic Development Board said last week. Growth sectors include IT, telecommunications, healthcare and aviation. Civil engineering and project management will be skills in demand, with Changi Airport Terminals 4 and 5 and new MRT lines under construction. Advanced manufacturing is expected to create more than 22,000 new jobs, such as for data scientists and robot coordinators, over the next eight years. There are also some 15,000 infocomms and technology vacancies available for positions such as software developers, computer engineers, system designers and analysts, while 3,000 precision engineering jobs are expected to be created by 2020. Mr Foo See Yang, managing director and country head of recruitment firm Kelly Services Singapore, says contract workers and freelancers can take advantage of companies' desire for flexibility in an unpredictable economic landscape. "Workers with exposure to different industries and cross-functional areas may have an edge over those with only a technical background," he says. Prime Minister Lee Hsien Loong also said in his National Day Rally speech last year the CFE was working on a strategy to support entrepreneurs in coming up with innovative ideas. UniSIM's Dr Theseira says entrepreneurship will continue to be very important to the economy going forward, but for it to drive growth, "we need the kinds of entrepreneurs who can build scalable businesses to compete at the global level". Many entrepreneurs are not yet taking advantage of Singapore's position in the midst of the huge Asean market, he notes.